Moscow is a city that longs to be explored. With a rich history and tons of museums and monuments to visit, history buffs will never be bored! If you enjoy food, Moscow has got your back, with tons of restaurants to visit, and even a Soviet-era style restaurant for the people who love history AND food! With a great public transportation system and a ton of festivals and events always happening, check out our guide to Moscow and make the city your next travel destination! Public transit is definitely an option for getting to and from the major airports in Moscow. There are three international airports: Domodedovo International Airport, Sheremetyevo International Airport, and Vnukovo International Airport. You’ll be able to get into the city using a train called the Aeroexpress from any of the airports. Tickets cost RUB 470 if you purchase them from the terminal at the station, or RUB 420 if purchased on the website. Trains from each of the airports follow a set route. From Domodedovo (DME), the train goes to Paveletskaya railway station; from Sheremetyevo (SVO), the train goes to Belorussky railway station; and from Vnukovo (VKO), the train goes to Kievsky railway station. It’s really quite easy to take the Aeroexpress — there is clear signage in the airport and all announcements on the train are also made in English. There are technically only two stops — the airport, and the final stop (depending on which airport you’re departing from). It is important to plan ahead, as the Moscow metro can be quite intimidating at first. Many signs are in Russian, so it can be a little challenging to figure out where exactly you want to go next. If you aren’t travelling light, and you are unsure of where to get off, you will most likely have an unpleasant experience. It’s probably best to find out which metro station and metro line is closest to your hotel — that way, you can minimize the stress! In terms of getting into the city on a taxi, taxis are a decent option if there are several of you travelling. It might be cheaper to go with Aeroexpress, and combined with the metro, you’ll still end up exactly where you need to be! There are usually quite a few taxi drivers waiting outside of the airport ready to negotiate prices. We do warn you to be careful though — just like anywhere else in the world, airport taxi drivers will quote you very high prices. RUB 1,500 is a decent price to get from the airport to anywhere in the city centre. Moscow also has the Über and Get Taxi apps; they work very well and you’ll always know how much you need to pay in advance. At the airport, a car will usually arrive within 15-20 minutes. Prices for a ride from the airport to the city centre using this app usually tend to be around RUB 1,500. We also get asked quite often if taking a taxi is safe. If they’re official taxis, then yes, they are safe. If it’s some random guy trying to give you a ride, we’d suggest you walk the other way! There are lots of taxi companies, so check out some reviews online. We also highly suggest that you avoid rush hour, usually between 8:30-10:00 AM and 5:30-7:30 PM. You’ll be stuck in traffic for hours and the price of fare is usually higher as well. If you happen to be travelling from the airport at this hour, we’d definitely recommend taking the Aeroexpress. There is one last option to get from the airport to the city. It’s called the “marshrutka,” which is essentially just a minibus. They’re located near the exits at airports, and a marshrutka usually fits around 15-18 people (depending on the model of the minibus). It’s also good to keep in mind that there is no specific place for luggage, so be prepared for a very chaotic scene with a ton of suitcases and people all over the place. There aren’t any specific schedules either — once the buses are full, they leave, and another minibus takes its place. Marshrutkas will usually take you to the closest metro station, which usually isn’t more than 30 minutes away. This option is significantly cheaper at RUB 100-150 per trip, but in general we wouldn’t recommend it as a comfortable way of getting into the city. Explore Moscow by metro! This option is fast, clean, convenient, and gorgeous as well. (Don’t believe us? Check out our Moscow Underground tour — it’s super popular!). The metro will quickly get you to any part of the city for a cheap price. There are various options in terms of paying for a ride on the metro, and it depends on how many trips you take — the more trips, the less each ticket costs. For example, one trip costs RUB 50, two trips costs RUB 100, and 20 trips costs RUB 650. There are also unlimited passes that are available – an unlimited one-day pass costs RUB 210, and an unlimited three-day pass costs RUB 400. Whether you’re buying a single trip or an unlimited pass, you’ll have the option of buying a paper ticket or adding these trips or tickets to a Troika card, which you can top up for all your trips (which can be used by several people if there are a specific number of trips on the card). Detailed price information can be found here. Look at this snazzy metro train! The Moscow metro connects the city centre with the city outskirts; you can pretty much go everywhere. A few things to note about the metro: avoid using the metro during peak hours (between 8:00-10:00 AM and 5:30-7:30 PM) because it gets insanely busy; also, unlike in some European cities, you only pay for your metro ride one time — once you get inside, you don’t have to pay each time you change from one line to another. The metro opens at 6:00 AM and closes at 1:00 AM. We’d recommend downloading an app called Yandex Metro. It’s available in English, and the app shows you how to get from one station to another, where to change lines, and also gives you information on trip length. 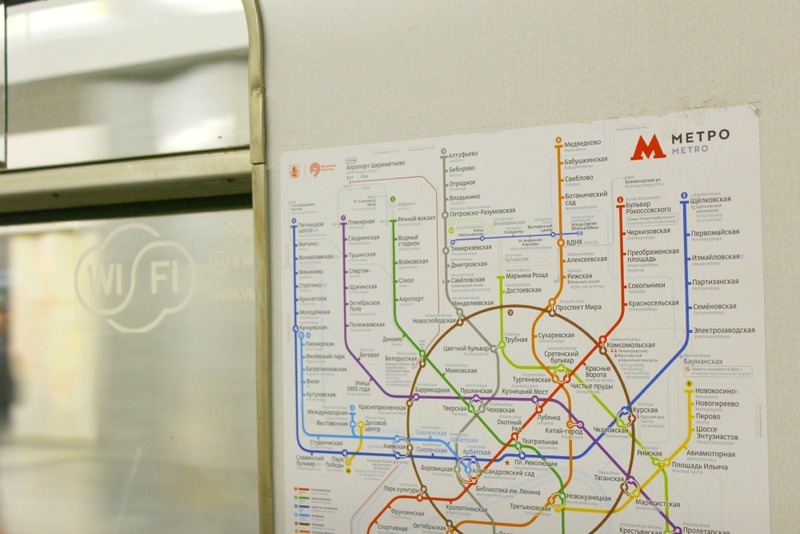 While Moscow’s metro map may seem a little intimidating at first, you’ll be a metro master in no time! Bonus: there’s free wifi! Taxis are fine for getting to the airport, but we don’t recommend taking a taxi around the city — it’s easy to get stuck in traffic, and prices can fluctuate during rush hour and with distance. Also, if you’re travelling sans a Russian speaker, it’ll be a little challenging to call a taxi company because operators rarely speak English. If you want an option other than the metro, we previously mentioned that Über and Get Taxi are also options, too. In terms of prices, the cost will obviously depend on the time of day and the destination (prices can also rise on official holidays and weekend evenings). For a 30-minute drive, the fare shouldn’t cost more than RUB 300. No matter where you go in the world, you’ll often hear the same thing: “the best way to explore our city is through walking.” And we completely agree! It’s safe to walk around the central part of Moscow even at night. Like in any big city, you still have to be aware of your belongings, and mind where you place your wallet and cellphone, etc. Pretty standard stuff. While Moscow is big, we definitely love exploring it by foot, district by district. Combine walking with taking the metro and you’ll definitely take in a lot more than you would if you took taxis everywhere. It’s also worth noting that a lot of streets in the historical centre are being converted into pedestrian-only streets! There are also bicycles available for rent city-wide from May to late October. You can take the bicycle from one location and leave it in another, so it’s a great option for getting around if you don’t feel like walking. To rent a bicycle, register on the website, and once you receive your personal login information you’re ready to explore the city by bike! Moscow is relatively new with bike culture, with the bike renting system being introduced in 2014, and bike paths only appearing in 2015. Be aware of your surroundings as drivers are still not used to sharing the road with bicyclists. If you’re not comfortable biking around areas with heavy traffic, we’d recommend biking around the Boulevard Ring and along the Moscow River embankment. If you’re looking for things to do in Moscow, well, you’ll be shocked at the sheer number of options you’ll have! From museums and art galleries, to sports, theatres, shopping, and historical monuments, you’ll have no time to be bored! Let’s start off with something for all the sports fans out there. In Russia, ice hockey is king. Russians excel at winter sports, and while ice hockey is a rough game, Russians are extremely passionate about the sport. If you really want to gain insight into what local sports fans are like, head to a Kontinental Hockey League game. Depending on the game you attend and what kind of seats you have, tickets can cost anywhere from RUB 600 to 2,000. Tickets are usually purchased online, and while they are all in Russian, Google Translate usually does a decent job translating. Check out Ticketland for tickets. The KHL season runs from late August until mid to late April. For all the art, dance, and music lovers out there, Moscow is a treat. If you’re looking to attend a ballet, be prepared to spend anywhere from RUB 1,000 to 6,000, depending on your seats and the type of performance you are watching. Tickets for classical music symphonies will also vary from RUB 600 to 4,000, depending on seating and the event itself. Tickets are available online, so it’s probably best to check each theatre’s website. For ballet, we’d recommend checking out the Bolshoi Theatre, the Theatre of Stanislavsky and Nemirovich-Danchenko, or the Kremlin Palace. For classical music, check out the Philharmonic Hall of Tchaikovsky, or the Moscow Conservatory of Tchaikovsky (unfortunately for the conservatory, tickets are not available for purchase online, though they are often available several days before the actual performance). The Bolshoi Theatre – the fanciest of them all! Russia is home to some of the hardest and most prestigious ballet schools in the world. The beauty of the dance and the costumes and the whole experience of seeing an actual performance will be an experience that you’ll cherish for many years. Meanwhile, Russian classical music has been famous for centuries, with composers such as Tchaikovsky, Glinka,Rachmaninoff, and many others solidifying Russia’s place on the classical music scene. Keep in mind that going to the theatre or to a concert for Russians is a big deal. We dress up and we turn it into a big occasion. Of course you don’t have to dress like you’re going to a black-tie event, but definitely change out of your sneakers and ditch the cargo pants or shorts. The Moscow Hermitage Garden is a beautiful place to relax, get a bite to eat, or take in an event like an opera show, ballet, or concert! 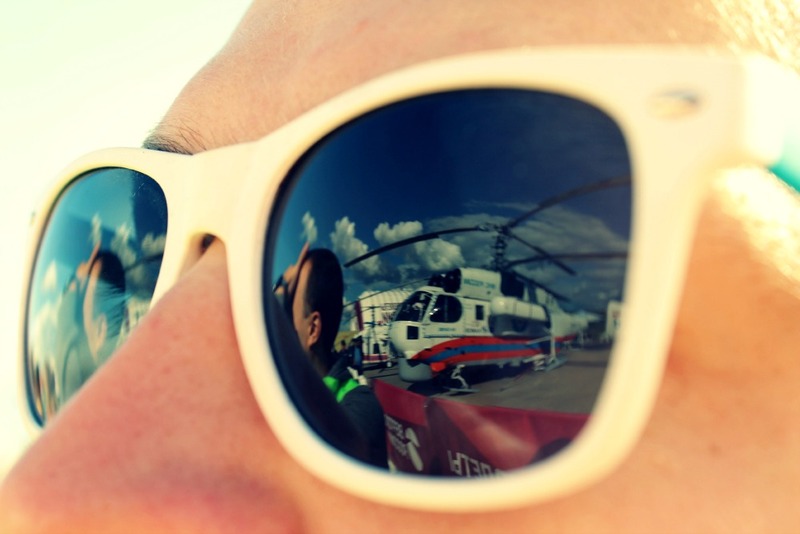 Nashestvie is the main Russian rock music festival in the country. It’s a multi-day festival that takes place just outside Moscow, and has already become iconic because of the bands that perform there, and for launching new stars. The festival is organised by a radio station by the name of Nashe, which means ‘our.’ The station mainly plays Russian rock and pop-rock. Tickets start at RUB 1,500 and increase depending on how many days you want to spend there, and what kind of access you want to have. Another very popular summer music and lifestyle festival is called Afisha Picnic. Traditionally, it takes place in Kolomenskoe Park, which is massive and has the ability to house large crowds. There are several stages with bands and performers of different styles — from rap, rock, and funk to straight-up pop music. What’s great is that they also bring in some famous foreign artists as well. Aside from the musical aspect, there are also plenty of other things to do at the festival: sports and games, shopping at markets filled with products from local designers, food markets with organic food, and so much more! Tickets start at RUB 2,500. If you’re looking for a place to check out work produced by young Russian designers, look no further than the Lambada Market. You’ll find clothes, accessories, wallets — practically everything you can imagine! It’s also just a great event to attend even if you’re not that interested in fashion. All the artsy, creative people are willing to talk to everyone about their work, and there’s just a great positive vibe all around. The event is usually held in May and at Christmastime. While the website is in Russian, Google Translate should work. And best of all, it’s free of charge! Faces and Laces is also another cool street sub-culture festival that is held in Gorky Park. This festival unites sub-cultures, street fashion, street sports, and brings everyone together in one big show. This is where you’ll find skaters and roller-skaters performing, break-dancers, and pretty much anyone you can imagine! Big brands like Nike also create installations here, engaging people with brands in real life. The festival is free of charge, and usually takes place at the beginning of August. 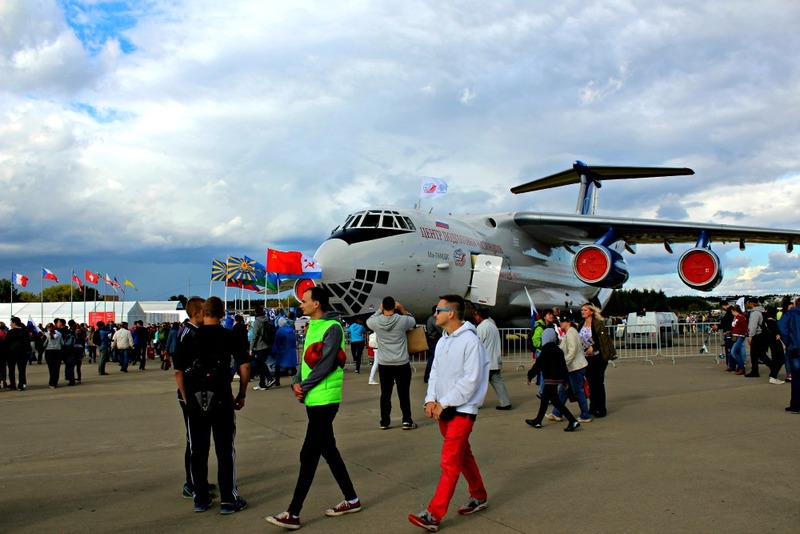 The Maks Avia-Salon takes place in a Moscow suburb every two years, usually in August. 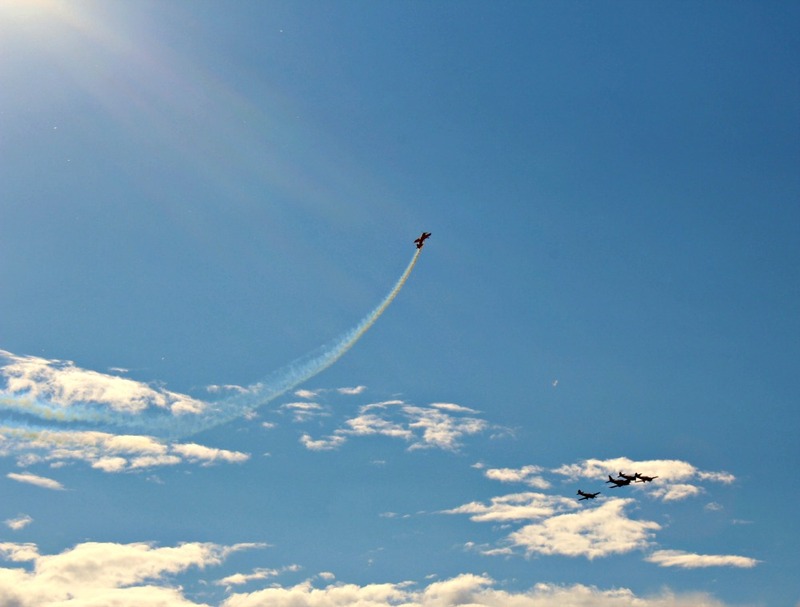 This show is for the public, and is a huge exhibition of contemporary and historical airplanes and helicopters. This show is basically a full-day show that showcases the best pilots and pilot-teams, who show off their unbelievable figures right in front of you in the sky. This show is a showstopper, so if you can get tickets (which start at RUB 800), we’d recommend snatching them up ASAP! Beautiful skies are perfect for all the photographers out there! It really is a great event for the whole family! The Maslenitsa Winter Festival is a popular festival that is definitely worth a separate post! It’s been a big celebration since pagan times, and eventually turned into a Christian holiday. We celebrate the end of the winter, and the beginning of spring – this is the week before Lent starts (which lasts for 40 days and ends with Easter). 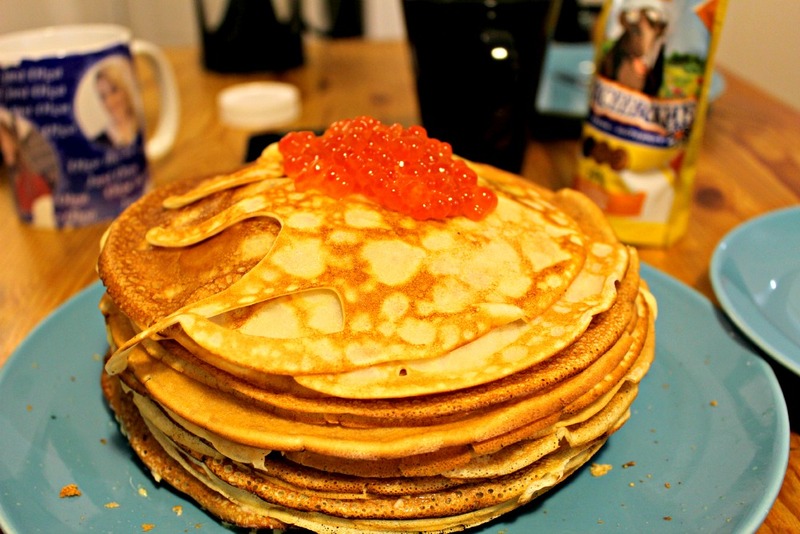 One of the main attributes of this week-long celebration is eating blini (Russian pancakes)! So essentially, we eat pancakes for an entire week… doesn’t sound too bad, eh? Everyone loves a good blini! If you’re travelling with kids, eating pancakes is something they’ll definitely be into! During the festival there are street celebrations, markets, and so many different kinds of activities for the whole family. The week-long celebration ends on Sunday, when festival participants burn a huge scarecrow, which is the symbol of winter. Dates of Maslenitsa vary from year to year depending on the religious calendar. All events are usually free of charge, and there’s no particular website where you can find everything – if you take a stroll around your neighbourhood you’re guaranteed to find people celebrating! On May 9th each year, Russia celebrates the end of World War II, which in Russia is referred to as the Great Patriotic War. Each family celebrates because everyone knows someone who participated in it. Celebrations are huge in each city – there are traditional military parades, with the biggest one happening in the Red Square. While it isn’t an open event, locals always check out the military march towards the Red Square via Tverskaya Street, and the air force that flies in the same direction. It’s a day full of joy, but also full of tears, as we lose more and more war veterans every year. Moscow is a city that is filled with a lot of street festivals, with people wearing historical clothes, who dance to music from the war era. There are plenty of information centres where, with the help of digital technology, you can learn about the events that occurred during the war: battles, war heroes – everything you ever wanted to learn! The day finishes with a huge fireworks display in different areas of the city. Information about the fireworks displays will be posted online so you can find out which is closest to you. Some great websites to check for events are Afisha and TimeOut Moscow. If you’re looking for something to get you hyped up for a trip to Moscow, check out a movie called Stilyagi, which means ‘Hipsters’. It’s a musical comedy-drama, describing Russia – in particular Moscow – during the 1950s. It’s about youth and what it was like to live in Moscow back then. There are a lot of bright costumes, good jokes, and it’s definitely not like any of the sad and depressing movies about Russia people often end up watching. If you’re a music lover check out a band called Bravo. Their instrumental songs are positive and will put you in an amazing mood! The song Moscow Calling, by the Russian rock band called Gorky Park also has a certain kind of spirit to it that will definitely put anyone in an adventurous mood! Fun fact: Gorky Park was the first Russian band to have their music aired on MTV! Another recent song that is quite interesting because it plays to certain stereotypes, is called Russian Girl, by Jenia Lubich. If you’re a bookworm and you’re looking for some great material on Moscow, check out a personal favourite called Moscow and Muscovites, by Viadimir Gilyarovsky. Vladimir Gilyarovsky was a journalist at the end of the 19th century, and his profession and charming demeanor made him a friend to people from a variety of different backgrounds – from thieves and prostitutes to some of the most prosperous people of Moscow. In the aforementioned book he describes Moscow from a typographical point of view (who lived in which district), and creates a vivid story with bright characters. It is extremely interesting and pretty hilarious at times. If you have any questions about tours in Moscow, feel free to give us a ring at +7 903 141 3998 or send us an email at info@moscowurbanadventures.com. Feel free to browse our Instagram account for Moscow travel inspiration while you’re at it! Hi Azhar! That’s so exciting that you’re going to Russia for the World Cup. Here are our current Russia tours: https://www.urbanadventures.com/country?cn=Russia&s-country=281. All of them are led by local guides who can give you insider knowledge once you arrive in town. I am coming on 17th september 2018 with my 5 frends .. can i book our personal guide?.. for a whole day? Yes you can! We offer private tours for any group size! Just fill out your details in this form: https://www.urbanadventures.com/create-your-own, and our Moscow team will get back to you! Thanx for the post. The bit about getting to and from the airport was very handy.